The Crone represents wisdom, repose, and compassion. The Crone in Greek mythology is Hecate - wise, knowing, a culmination of a lifetime of experience. Crone goddesses include: Hel, Maman Brigitte, Oya, Sedna, Skuld, and others. Another cross-cultural archetype is the three goddesses of Fate. In Greek Mythology they are the Moirai; in Norse mythology they are the Norns. The Weird Sisters of Shakespeare's Macbeth and Wyrd Sisters of Terry Pratchett's novel of the same name are believed to be inspired by these Fates. The three supernatural female figures called variously the Ladies, Mother of the Camenae, the Kindly Ones, and a number of other different names in The Sandman graphic novels by Neil Gaiman play self-consciously on both the triple Fates and the Maiden-Mother-Crone goddess archetypes. The Celtic triple spiral or triskele symbol is sometimes called the spiral of life and was found in the Newgrange site from the Bronze Age in Ireland. 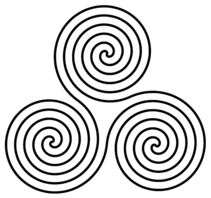 The triple spiral is an ancient symbol of Celtic beliefs, and was used consistently in Celtic art for 3 millennia. The Celts believed that all life moved in eternal cycles, regenerating at each point. Celts also believed that all important things came in three phases; for example: birth, death and rebirth and mind, body and spirit. The triple spiral later became the triskele used in Christian manuscripts. 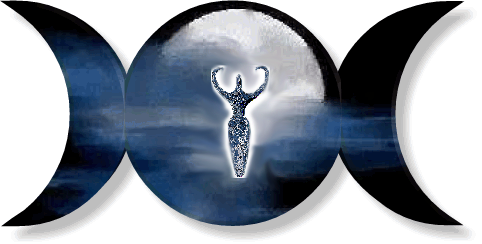 In neopagan religions, the triple spiral is also used to represent the triple goddess. According to Uriel's Machine by Knight and Lomas (2003) the triple spiral may represent the nine month period of human pregnancy, since the sun takes a fourth of a year to go from the celestial equator (an equinox) to extreme north or south declination (a solstice), and vice versa. During each three-month period, the sun's path appears to form a closely-wound quasi-helical shape, which can be likened to a spiral, so that three spirals could represent nine months, providing an explanation for a link between fertility and the triple-spiral symbol.